Baby's floating bath letters and numbers. The Letters & Numbers float in the bath and stick to sides of the bath and walls when wet. Includes 26 letters (A-Z), and 10 numbers (0-9). Letters and numbers stick to the bathtub wall. Soft foam letters float in the water. Makes bathtime fun!. Includes all 26 letters and 10 numbers. 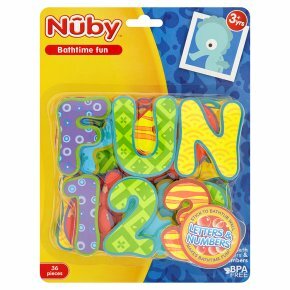 BPA free.The Nûby\ foam bath letters and numbers are an easy way to make bath time a fun learning experience. The 36 letters and numbers float in the water and stick to the walls when wet. This product exceeds all governments safety regulations and standards. Warning: Prevent Drowning. Do not leave child unattended during bath. Alwayskeep child within adult's reach. Do Not allow other children to substitute for an adult supervision. Always check water temperature before placing child in bath. Please retain these instructions for future reference.